Price from: $565 - Book now! Welcome to Siem Reap, the provincial capital and gateway to the ancient Angkor Temples. 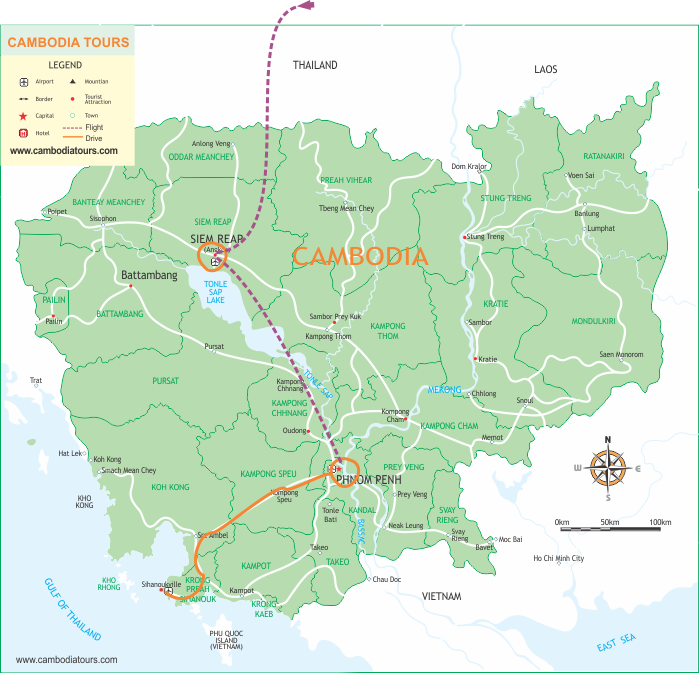 Upon arrival, driver and tour guide of Cambodia Travel will meet you at the airport and transfer you to the hotel for check-in. If time is permitted we visit the local school where they train the traditional Apsara Dance. We will have opportunity to learn about the Khmer Art history and meeting, talking to young dancers at their show. After breakfast, we are taking a break from temples and going on a traditional wooden boat on the Tonle Sap. This is the largest permanent fresh-water lake in South Asia and flows into Tonle River, joining the Mekong in Phnom Penh. We will see a “floating village” – boats that have been converted to look like houses and the “village” moves from place to place according to the water levels. We continue to one of the city’s lively open markets, Psar Chass, called the “Old Market”, where you can see the locals shopping and going about their lives! On the way back to the town, you will visit silk farm village. This morning, you will leave Siemreap for Phnompenh by flight. Arrive in Phnompenh, pick up and transfer to the hotel for check in. In the afternoon, take a half day tour in Phnompenh. we will visit Royal Palace, which is now home to the royal family. In the northern section of the palace grounds lies the Silver Pagoda, the most sacred one in the country and The National Museum. Begin your morning with breakfast at hotel then set out to see the capital city of Phnom Penh which was once considered the loveliest city of Indochina. Despite its recent turbulent history, it still maintains considerably charming. A city tour acquaints us with some major sights of Phnom Penh. The Tuol Sleng Prison Museum and the notorious ‘Killing Fields’ of Choeung Ek are not to be missed. A visit to these sights provides a deep insight into the painful bloody rule of the Khmer Rouge. Following lunch (on your own budget), drive about 5 hours to Sihanouk Ville which is very famous for its beautiful beaches. After breakfast at the hotel, enjoy your free time until our driver transfer you to the Phnom Penh International Airport for your flight home. Thank you for kind request. I am customizing the private package tour for you and I will send to your email within couples of hours.